For a developer who prides himself on building with a “social mission,” the bruising battle to break ground on the mammoth Atlantic Yards project has not been easy — to say the least. If you type the words “Bruce Ratner” and “scumbag” into Google, you get 567 hits. It’s a strange twist of fate for the affable, rumpled Cleveland native, who spent his summers at Columbia Law School working for the NAACP Legal Defense Fund, and the rest of his 20s and 30s as a consumer advocate, defending the poor from the scams of small-time hucksters and corporate con men. As a former Ed Koch-era Consumer Affairs Commissioner, Ratner, 66, grew “very accustomed to the press, but only in a positive way,” he recalled in an interview with The Real Deal last month. Later, even as the developer who brought big-box stores to the boroughs, who helped redevelop Times Square, and who transformed Downtown Brooklyn with MetroTech Center and the Atlantic Terminal Mall, he enjoyed largely favorable PR. That all changed with the 2003 unveiling of the Atlantic Yards project, which promised 16 residential and office buildings, affordable housing, parks and a brand-new professional sports arena for the soon-to-be Brooklyn Nets. An aggressive coalition of opponents mobilized, saying the project would force hundreds of residents from their homes, clog the streets with traffic and pollute Brooklyn’s skyline with architectural monstrosities. The Atlantic Yards is by no means the only high-profile project Ratner, through his company, Forest City Ratner, has pursued in recent years. But none of those projects have garnered the negative ink of the Atlantic Yards, a trend that continued last month with a fresh spate of stories challenging its financial viability. Seven years of lawsuits helped delay groundbreaking on the arena portion of the project until just last spring, all the while providing a running narrative that often cast Ratner as the ruthless Goliath to the everyman Davids being driven from their homes. The controversy has thickened Ratner’s skin so much that if you ask him today about the latest wave of headlines — which implies that Forest City is about to abandon the affordable-housing portion of the plan — a frown flickers for just a second, like he’s just bitten into a lemon. Then, just as fast, he simply shakes his head. Mayor Bloomberg, like several Wall Street analysts contacted by The Real Deal, dismissed that notion, noting that the language cited by the Post was taken from the “risks” section of the firm’s 10-K, which requires companies to detail worst-case scenarios. While it is certainly true that Ratner’s firm took a beating during the recession — with its stock price falling from $69.75 a share at its high in April 2007 to $3.74 two years later, before rebounding to just under $20 a share now — the analysts noted that the same language cited by the New York Post has been included in every single 10-K filed by the company since it was first required to do so a number of quarters ago. For his part, Ratner responded wearily when asked if there were any chance Forest City Ratner would abandon the residential portions of the project. Of course, the only way for Ratner to truly silence his doubters will be to finish the project. The son of a Lithuanian immigrant who sold coal, and then started a building-supply business in Cleveland, Ratner attended Harvard expecting to become a doctor. He switched to English lit, then enrolled at Columbia Law School during the height of the Vietnam War. Ratner arrived in New York in 1970, when students were occupying campus buildings, and it was impossible not to become “conscious of the politics of the time.” Between his first and second years of law school, the number of students in his class dropped almost 30 percent, as the government did away with draft deferments, and scores of his peers fled to Canada, joined the reserves or shipped off to Vietnam. Ratner, excused from service due to his asthma, embraced the progressive spirit of the age. During his summers, he worked for the NAACP Legal Defense Fund. After graduating, he spurned the high-paying world of corporate law for public service, following one of his professors to the City Department of Consumer Affairs, where he worked on fraud and poverty law. After a stint at NYU teaching consumer law and a summer running the successful City Council campaign of progressive candidate Henry Stern, Ratner, then just 33, was tapped by the newly elected Ed Koch to lead the Department of Consumer Affairs. Through these positions, Ratner got to know a generation of political leaders, as well as garner a deep knowledge of city bureaucracy. But in 1982, at 38 years old and with a young family to support, Ratner was making $52,000 and decided he wanted a more secure financial future. He gave himself eight years to earn enough money to produce $125,000 a year in “passive income” (not such a modest goal; in today’s dollars that’s about $500,000), figuring he could then focus on whatever he wanted. So in the depths of what would come to be known as the “Reagan Recession,” Ratner rented 125 square feet of space in the Flatiron Building, subsisting on eight months of accumulated leave time from the city, called up brokers selling buildings, and convinced them to send him their pro-formas. 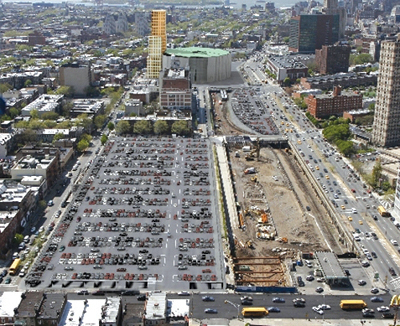 The Atlantic Yards site at the intersection of Flatbush and Atlantic avenues. 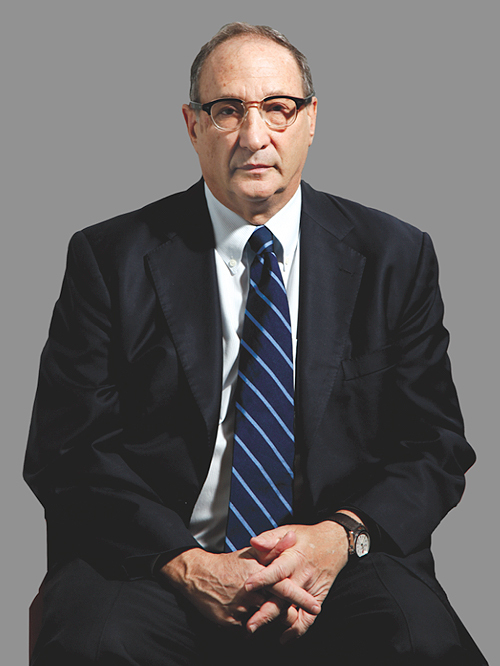 In the beginning, Ratner struggled to reconcile his past with his present. So, “rationalizing” that commercial buildings offered “an economic development aspect, which meant jobs,” Ratner identified his first target: the old Herald Tribune Building on 41st Street, a 250,000-square-foot Class B office tower near Times Square — which, even then, the city was talking about redeveloping. Ratner formed a syndicate, divvied up the venture into 36 shares, and used his connections to raise the funds. He started with his family. While Ratner’s father worked in building supplies, his uncles were developers. Their firm, Forest City, had grown to become a massive development and management company, and had gone public in 1960. Ratner found a receptive audience for his plans back home in Cleveland. Ratner was able to make a deposit in the midst of a recession, but by the time of the closing he was still short on funds, so he convinced the seller to grant him an extension. Then, through a friend, he met Stephen Ross, who was also dabbling in syndication at the time. With Ross’s help (and that of other partners), Ratner closed his first deal. He then completed a second deal, for a 110,000-square-foot building at 114 East 32nd Street, and by his estimate earned hundreds of thousands of dollars in management and closing fees. However, as the recession drew to a close, building prices began to increase, and Ratner began to think twice about his ability to out-fund-raise competitors. Around that time, a partner of his real estate attorney mentioned that Brooklyn Polytech University was looking for partners to develop a large area of Downtown Brooklyn. It was not the kind of project that New York real estate magnates were jumping to get a piece of. At the time, Brooklyn was crime-ridden and depressed, and no new office space had been built in close to 25 years. But Ratner was interested. “Like any developer, Bruce wants to make money,” recalled Michael Bailkin, the attorney who helped conceptualize the idea for what would later become known as MetroTech. Ratner approached his cousins with a detailed plan to develop an office complex that would later grow into 11 buildings, with 3.7 million square feet of office space, and produce more than 20,000 jobs. And a new venture was born: the New York City-based subsidiary of Forest City Enterprises, named, appropriately enough, Forest City Ratner. While Ratner worked through the long approval process, he also seized on other, more immediate possibilities. At the time, Morgan Stanley was planning on relocating to New Jersey, and Ratner approached the financial giant about moving into MetroTech instead. When it became clear that the project would not be completed in time, Ratner suggested an alternative location. Another financial firm had planned to build a facility nearby before it went under. So Ratner approached the city and won approval to construct One Pierrepont Plaza, the first new office building in Brooklyn in 25 years. The 650,000-square-foot building opened in 1988. Though the project initially produced some opposition from nearby Brooklyn Heights residents, their concerns were quickly drowned out by politicians eager for jobs. “When Bruce and Forest City made a commitment to Downtown Brooklyn, there were no other private investors interested,” she said, noting that the new investment also brought funds for subways and other infrastructure. It was Brooklyn Borough President Marty Markowitz who first approached Ratner about the Atlantic Yards. After having touted the need for a national sports team during his run for office, Markowitz said he began working on Ratner to buy the Nets and move them out of New Jersey. Neither Ratner nor Markowitz foresaw the level of opposition that would ensue. What they saw, Markowitz said, was an “eyesore” in need of transforming. Ratner and his representatives blame the majority of delays on litigation from opponents that dragged on for years. But the recession, along with a rise in construction costs, has obviously complicated the situation, throwing financing into doubt at certain points and forcing the company to make serious modifications. Among the most dramatic came in June 2009, when Ratner dropped Frank Gehry as the arena architect, in an effort to save what the New York Times said was $200 million. In addition, Forest City recalculated the revenue it could expect from sponsorship deals and luxury suites, and slashed other expenses — prompting accusations of betrayal from project detractors. Some opponents complained that the new model resembled an airline hangar. “We designed a more compact arena, and did things not visible above grade. The infrastructure foundations are for [the] arena proper, and no longer for the other buildings,” she said. Even with the modifications, it was unclear if the firm could make the deal work. To finance the arena, Ratner relied on tax-exempt bonds allowed under a program used to finance the construction of both the new Yankee Stadium and the Mets’ Citi Field that expired at the end of 2009. Not only did Ratner need to overcome a legal challenge affirming the right of the state to use eminent domain to secure the land before that date, he also needed to close on the sale of the bonds prior to the deadline — a feat that seemed difficult to achieve in the fraught months that followed the downfall of Lehman Brothers and the freezing of the credit markets. In the end, Ratner and Gilmartin closed on the bonds — but only at the eleventh hour, in the midst of a major snowstorm. To close the deal before the holidays shut everyone down for business, Gilmartin said she convinced a worker at the UPS facility in Maspeth, Queens, to sort through thousands of documents in search of an errant letter of credit essential to make the deal work. He estimated the arena will generate annual net income of about $110 million to $120 million, cost $30 million to operate, and require about $45 million to $50 million a year to pay off financing, leaving the company with about $35 million a year in profit — which will generate a roughly 10 percent return on the $350 million invested by Forest City to build the stadium. As for the rest of the project, there’s currently a better outlook for the residential portion of the project than the commercial. Profits from the planned residential buildings are “going to depend on where construction costs wind up,” Ratner said. Gilmartin said the company has finished the schematic design phase of the project’s first residential tower, a 400-unit building on Dean Street that will be 50 percent affordable units and 50 percent market rate. The company is in the process of developing two separate possible designs for the building — one modular, aimed at cutting costs, and one conventional. It expects to send contract documents out to bid on both designs in the “latter part of the year,” Gilmartin said. Once the company has a realistic estimate of construction costs to take to a lender, Gilmartin said, it will begin raising funds from lenders. And once ground is broken on the first residential tower, the company plans to build consecutively at six- to nine-month intervals. That first construction could begin as early as this year, said one company spokesperson, an assertion that followers of the Atlantic Yards say they have heard before. Dan Fasulo, managing director at Real Capital Analytics, said that while financing was a problem a year ago in the residential markets, he does not expect it to be a problem for the residential portion of the Atlantic Yards now. Gilmartin downplayed assertions by some analysts that raising funds would be “easy,” but she said the company plans to go to lenders with a detailed armory of numbers aimed at proving the project’s viability. She noted that the company recently completed the leasing of its 36-story rental 80 DeKalb “in the time we projected, and our rents were in line with our pro forma. “When you talk to a bank, you need to prove out your rents, and the 50 percent of our units that are going as market-rate housing are going to peg pretty closely to what DeKalb is performing at,” she said. Still, the office market remains depressed compared to how it was performing during the boom, and Forest City is unlikely to construct any new office space or sell condos at the Atlantic Yards until both markets rebound. This emerging split in market sectors is apparent in the firm’s overall activities across the city and country. Forest City’s overall challenges have been reflected in its stock price’s big drop and partial recovery. Paul Adornato, an analyst at BMO Capital Markets, noted that Forest City has taken a number of measures to shore up its balance sheet, such as forming joint ventures on a number of properties, including locally at the Ridge Hill Mall in Yonkers, which has been slow to lease up. In March, Forest City Ratner sold a 49 percent stake in 15 area shopping centers, including the Atlantic Center, a property in the Times Square area, and a mall in Harlem, raising $172 million, according to the Wall Street Journal. Elsewhere, the parent company raised $17 million by selling shares in three Washington, D.C.-area apartment developments, and $25 million by unloading the Simi Valley Town Center Mall in California, among others. Overall, since 2009, Forest City has sold $2.9 billion in assets and used the money to pay down debt and increase its liquidity. The firm’s new Frank Gehry-constructed apartment tower in Lower Manhattan is leasing well, but Adornato noted that the rents are approximately 10 to 15 percent below what was originally conceived when the company broke ground seven years ago. 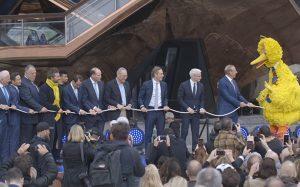 Ratner insisted that the Atlantic Yards is back on track.